On October 14, 2014, an invited audience of UBC faculty, staff, graduate students and their friends and family joined with members of the Killam family and Killam Trustees to celebrate this year’s UBC Killam Laureates. The awards presentation and reception held at UBC’s Aquatic Ecosystems Research Lab (AERL) is an annual event held to recognize the achievements of the newest additions to UBC’s Killam community. David H. Farrar, Provost and Vice-President Academic, Susan Porter, Dean and Vice-Provost of Graduate and Postdoctoral Studies, members of the UBC Izaak Walton Killam Memorial Fellowships Committee and Trustees of the Killam Trusts hosted the event, presenting award certificates to winners of the Killam Postdoctoral Research Fellowships, Killam Doctoral Scholarships, and Killam Faculty Research Fellowships. Highlighting the festivities were video presentations created especially for the celebration featuring several of the newest laureates. These video introductions to the scholars and their work offer brief glimpses into the worlds of these passionate and accomplished individuals. Full UBC Killam Profile playlist. This year’s Killam-Donald N. Byers Memorial Prize was presented to Miriam Matejova, a PhD student in the Dept. of Political Science. This additional $3,000 prize goes to the top ranked student in the annual Tri-Agency/Affiliated competition. Ms. Matejova was also awarded a 2014 Vanier scholarship. Among the other honours presented at the event were the 2014 UBC Killam Postdoctoral Research Prizes, awarded to Dr. Mathias Görges and Dr. Jeremy Hirota in recognition of their research achievements while at UBC. The Postdoctoral Fellows Office (PDFO) at the Faculty of Graduate Studies awards these two $5,000 prizes annually in the hope that the award will help advance the recipients’ professional careers to heights beyond those already demonstrated in their current work. A closer look at the work of Dr. Jeremy Hirota, UBC Faculty of Medicine, a post-doctoral researcher at the Centre for Heart Lung Innovation at St. Paul’s Hospital. A closer look at the work of Dr. Matthias Görges, member of UBC’s Electrical and Computer Engineering in Medicine/Pediatric Anesthesia Research Team. The Killam Endowments, comprising the Killam General Endowment, the Killam Memorial Salary Fund, and the Izaak Walton Killam Memorial Fund for Advanced Studies, support programmes at the University of British Columbia for the most distinguished researchers at the doctoral, postdoctoral, and faculty levels. The various competitions held over the past year reflect the academic excellence of research and scholarship at UBC. The Killam Endowments were established by Dorothy J. Killam in memory of her husband Izaak Walton Killam. The designation is conferred by the Board of Governors on the recommendation of the President to recognize exceptional members of faculty who have distinguished themselves as scholars in research and/or teaching and learning. 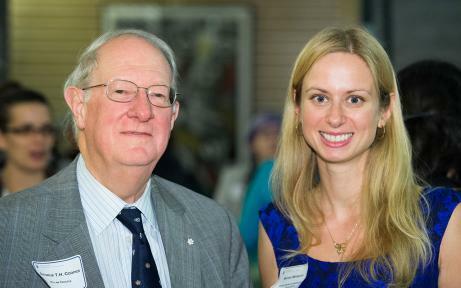 The Killam Awards for Excellence in Mentoring are based on sustained mentorship of numerous graduate students over many years. Mentoring may be related to, but is perceived as differing from, classroom teaching and may be distinct and separable from the usual measure of research productivity. One award recognizes faculty members in the mid-career category – that is, for those who have held university appointments for less than 12 years – and the other recognizes faculty members in the senior category – that is, for those with 12 or more years of university service. Fellowships are open to all UBC faculty members, with tenure, who wish to devote full time to research and study in their field during a recognized study leave (sabbatical). Up to ten prizes are awarded each year for excellence in research. Five prizes go to professors in the humanities and social sciences, and five to professors in the natural, applied and health sciences. Killam Teaching Prizes recognize faculty members with at least three years of teaching at UBC. Established University-wide, the prize is adjudicated within each of the twelve Faculties under procedures defined in the Faculty and approved by the Provost. Candidates may be nominated by colleagues, students, or alumni. The award recognizes distinguished teaching at any level or combination of levels: introductory, advanced, or graduate (including supervision). The Izaak Walton Killam Memorial Postdoctoral Research Fellowships are awarded to distinguished scholars from Canada and around the world, who have recently completed their doctorate degrees at a university other than UBC. The Killam Postdoctoral Research Fellowships provide support for two years with a stipend, travel allowance and medical benefits. The Killam Postdoctoral Fellow Research Prizes are awarded annually to full-time postdoctoral fellows in recognition of outstanding research and scholarly contributions while at UBC. Killam Graduate Teaching Assistant Awards recognize the valuable role that teaching assistants play in our undergraduate programs. Established University-wide, the prize is adjudicated within each of the twelve Faculties under procedures defined in the Faculty and approved by the Provost. The award recognizes skills, abilities and contributions that result in a high level of respect from undergraduate students and academic or course supervisors.